Growing up, our after-school dinners were always well-balanced: protein, salad or vegetable, starch, and fruit for dessert (or black & white milkshakes for special occasions). While I don’t necessarily recall the details of each of those meals, I do remember that the solitary instance in which my mom made brussels sprouts was not that well-received. The four (at the time) little Taylor girls were not keen on eating bright green globes that grow on weird looking stalks. Also, the name just sounds weird. Today, brussels sprouts are the new kale. They’re popping up on menus everywhere, and I’ve recently taken to ordering a side of them every time I go out to eat. I like when they’re slightly charred, filled with crispy parts (the leaves turn into crispy chips, kind of like kale), and drenched in balsamic vinegar. As much as I enjoy them, I always find myself wanting for a bit more or less of just one aspect of these little green bulbs — more crispy pieces, less balsamic, not cooked as long. Enter this salad and behold the power of raw brussels sprouts. Prior to talking to Molly about this salad, I hadn’t given much thought to making a salad made entirely of brussels sprouts, but I’m a convert. I almost prefer this way of eating them — who knew! It’s simple and packs a deeply flavorful punch. Don’t knock it ’til you’ve tried it. Fill a large mixing bowl with water. 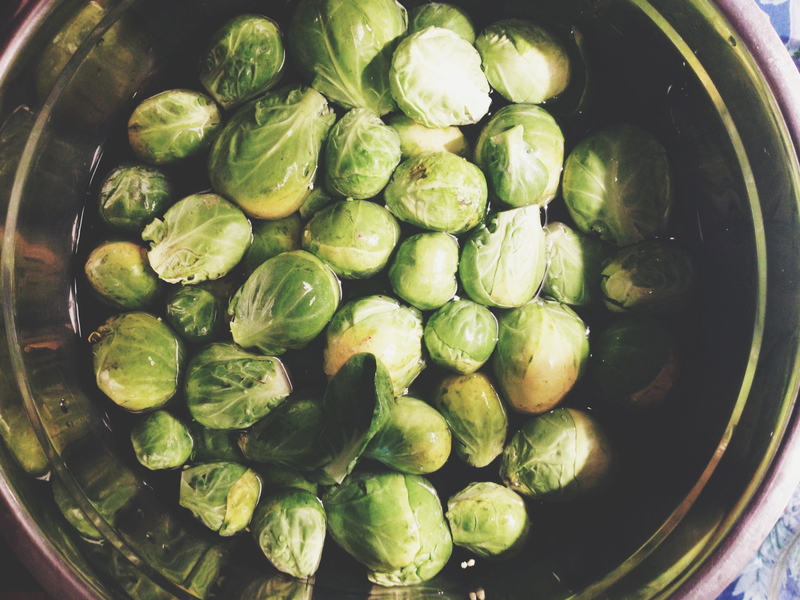 Chop ends off of the brussels sprouts and put them in bowl, allow to soak for a few minutes. In a small pan, toast almonds until they’re slightly darker and fragrant, about 4-5 minutes. Allow almonds to cool for 1-2 minutes, then roughly chop. Drain brussels sprouts and dry on a clean dish towel. Using a large knife (or food processor if you’re fancy like that), chop/shred brussels sprouts. In a small bowl, combine olive oil, apple cider vinegar,whole grain mustard, and salt & pepper. Mix with a whisk or fork until combined. 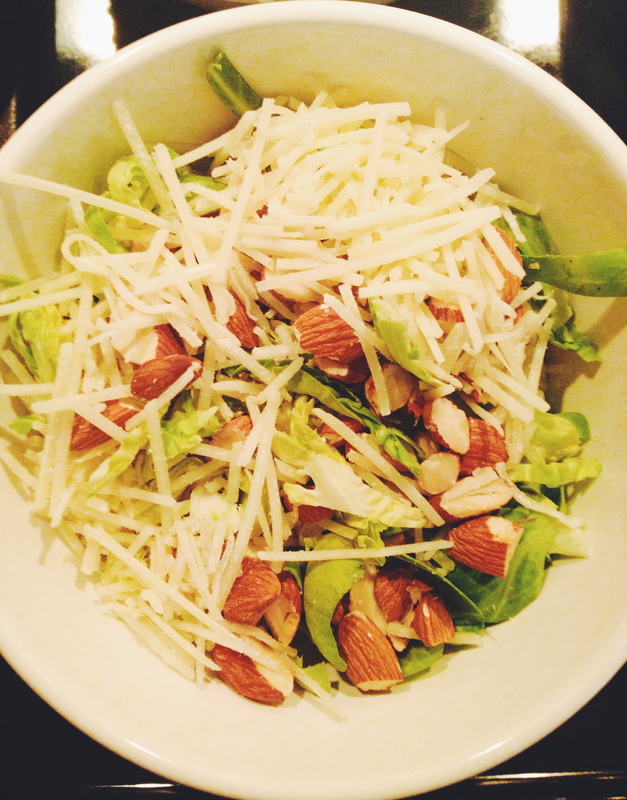 Toss brussels sprouts, grated cheese, and almonds in a bowl. Add dressing and stir thoroughly. Enjoy immediately!